The status quo. It’s a killer. Your prospects stay with it as long as humanly possible because they hate to change. That doesn't help you. It takes more and more effort to meet your numbers. So what’s the answer? Timely sales intelligence. 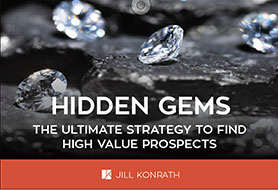 Learn how to find high value prospects by identifying when they're most open to taking action. Discover how to use trigger events to initiate more opportunities, expand existing relationships, shorten your sales cycles and minimize competition.